On 16th August 2010, the ISDN control line was established. Between the Chilbolton site and the supercomputing centre in Groningen, there is 10 Gbit/s link. However, this link is mono-directional. We can send data to the Netherlands, but there is no way to send data back. For the data itself, this is fine. However, it is also necessary to send back control signals. For the telescope a conventional Internet connection is used. However, for the control of the 10 Gbit/s transmission equipment a second ISDN line is required. Caption 1 : The lines run through a tunnel on the site. 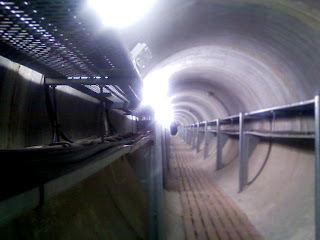 This view is looking down the tunnel in the direction of the termination point, where the BT lines first come onto the site. 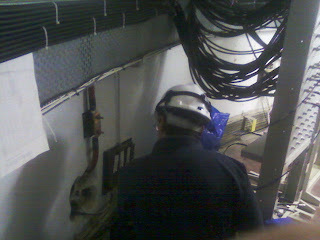 Caption 2 : BT engineer fitting the ISDN connection in the room where the terminations are.